The Crossfire's time has come. 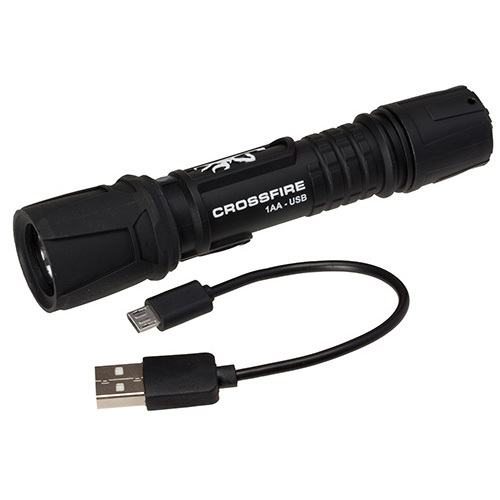 One of the best little flashlights ever devised now has the added advantage of convenient USB charging built right in. Just attach it to a USB charger just like you do with your phone or other devices. You can keep your Crossfire fully charged and ready for action all the time. And it allows easy recharging in the field with the Browning POWER BANK or other similar charging stations. The ultra bright LED light never needs replacing. And the multiple brightness setting let you be in control of how long your full charge will last. Bright, tough and affordable. Sometimes you just need a no-nonsense flashlight to keep in your home emergency kit, in the glove box of your truck, or in the drawer of your night stand. The crossfire is that light. Its high impact resistant polymer housing is tough and will take an enormous beating, ensuring that your light will still work in the most adverse of conditions. It runs on AA batteries - found at every grocery store and gas station, and in a pinch you can pull them out of your other electronics. Use the included diffuser dome attachment for a soft area light or signaling beacon. Lastly, it features three modes - high, low and strobe for emergencies. - Effective Distance: 150 yds.